I discovered Kristin Hannah by chance on Goodreads after someone once mentioned randomly that she writes like Danielle Steel. 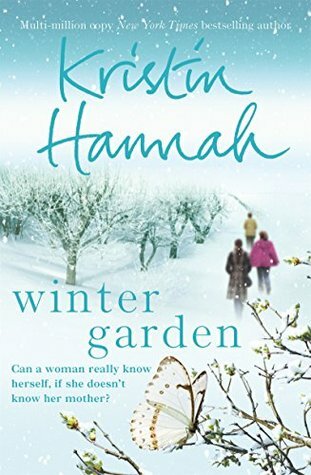 A few days later, on a book tag on Facebook ,I saw a couple of friends mention that 'Winter Garden' was one of the finest books that they have ever read. I was intrigued and since I was on a book buying spree, I bought this one. The book has a dreamy wintry cover with apple trees and snow in white and blue. You can also notice the almost blurry silhouette of three women in the background. The book doesn't promise much, it only asks a simple question. Can a woman know herself if she doesn't know her mother? The Whitsons are a happy family, or so they think. Evan and Anya Whitson have been married for close to fifty years and have two daughters Meredith and Nina. While Anya is madly in love with Evan, she doesn't care much for her daughters. Actually, she doesn't even give a damn about them. While Evan equally dotes on his wife and his children, the only way that he can bring them together is via a fairy tale narrated by Anya. The story about a peasant girl and a prince. This is the only way the mother communicates with her daughters and the daughters have no idea what they have done to not receive any love from their mother. While a childhood incident has scarred Meredith for life with regards to her mother, Nina is a photo journalist who stays away from home most of the time and has learnt to let go and ignore her mother's lukewarm sentiments. Meredith is now talking care of the family apple farm and their estate 'Belye Nochi' or 'White Nights', while struggling with her own failing marriage and her two daughters. Nina is away in Africa in a jungle photographing women and has occasional romps with her lover Daniel to whom she doesn't want to commit to. The two sisters are as different as they can be and not regularly in touch. When Evan Whitson falls ill and eventually passes away, the three women in his life come face to face with each other. While Meredith and Nina are trying to come to terms with their loss, they are totally at a loss when it comes to their cold and disapproving mother. Before Evan passed away, he asked his daughter to get to know their mother better. He asks them to have their mother tell them the fairy tale from the beginning to the end. While Meredith doesn't think much of this, Nina doesn't let it go. Anya starts behaving more cold and weird after the death of her husband and spends indefinite time in her winter garden. With Nina being away again, Meredith finds it very tough to handle her work, her marriage, her apple orchard and her mother. When Anya starts behaving really strange, Meredith decides to put her mother away in a home so that she can be taken care of. Nina comes back and doesn't agree to this and decides to fulfill the promise she made to her father. Slowly, one day at a time, she coaxes her mother to start telling the fairy tale after a few shots of vodka. Anya agrees to, but lays down her conditions that Nina and Meredith accept. Thus begins the fairy take of Vera and Sasha. This is a Russian fairy tale set more than five decades ago, an unexpected journey in war-torn Leningrad. Vera is a peasant girl who lives with her mother and sister, Olga. She falls in love with her prince Sasha and marries him, but their life is not easy. Sasha is soon called to join the war and he leaves behind Vera and their two children in the care of Vera's mother and grandmother. They struggle to make ends meet with a war raging around them and within them. With time Nina and Meredith realize that this fairy tale is not all fiction and has some element of reality to it. Day after day as Anya narrates this story, Nina and Meredith learn the truth about their mother and why she is the way she is. Through this journey each of the women find the true purpose of their life and all the solutions to their problems. Kristin Hannah did remind me of Danielle Steel since she also writes about women and relationships. But Kristin Hannah has a style of her own and excels at it. She writes in detail explaining and describing the scene in a picture perfect way. I could close my eyes and imagine Belye Nochi. While the writing is profound and effortless, the story takes a good time to build up. Almost the first half of the book is about the dysfunctional relationships that the three women share and how they are broken in their individual lives too. It was a bit hard to get to this phase because it does test your patience when nothing picks up soon. But I'm glad I held on. When the fairy tale begins, you are consumed by it and before you know it you are laughing and crying with Vera. While a part of me always knew how the fairy tale would merge with reality, the way it happened just broke my heart into a million pieces. The story is about a story in a story but it doesn't get chaotic. While Meredith and Nina come out as brave women, it is Anya who steals the show here. From a woman who has nothing but indifference to her daughters to becoming the soulful narrator of her own fairy tale, she captures you with every word. The past that she describes had me crying more than once and I couldn't wait to know the real her and why she was like this. The fairy tale is beautifully conceptualized and paints a picture in your mind. I'm not too sure if Anya's behavior towards her daughters will be justified to many, but for me it did make sense. The ending was a total surprise and I was bawling my eyes out without realizing it and honestly, I was sad when this book ended. I just wanted the fairy tale to go on and on. The book is a celebration of brave women. The women who never gave up on each other. The women who held hands together when they were crumbling. The women who helped each other see their true self. The women who helped each other heal. The women who helped each other win. All thanks to one woman who refused to give up. Verdict: Brilliant writing and beautiful storytelling This book evokes all the right emotions and leaves you with an unsaid spark within. I started reading this book and somehow could not complete it for some reason. Your review will now make sure that I pick it up and finish it. Kristin sure has a way with words. I loved the way she has etched the characters of the women, especially Anya. Do try it again. It has a beautiful ending. This review has me intrigued. This book does seem like a really interesting read. I will definitely check it out. Do check it out, Shantala. Thank you for recommending the book and for the book reviews that you do. I loved to read and then all of a sudden I could not find good books to read. Tried some books reviewed by others and I felt that I lost my interest and love to read. Sometime ago I started reading your reviews and tried one book after the other - loved all of them. Read - Chocolat, Like water for Chocolate and Winter garden in the past couple of weeks . Starting on The night Circus today. Do keep doing the reviews. Love them !!! I hope you enjoy The Night Circus as much as I did.